After starting the season with a second place in drumming, Monaghan's Mighty Drum Corps went on to win the drumming in its remaining six EUSPBA sanctioned contests. (L - R) Martin Duffy, Gregory McLaughlin, Joe Jacobs, Marianne Janniello, Rob Cirincione, Dan Hamilton, TJ Hagan, Gordon Bell, Richie Janniello and Andy Hamilton. Leading Man Gordon Bell took the reigns of the drum corps this past season. Gordon has been recognized as one of the country's best drummers for four decades and counting. He is the winner of nine consecutive EUSPBA Champion Supreme titles for Open Drumming. Click here for more information on Gordon. On the Beat Former drum sergeant Martin Duffy (right), lead the corps for the past three years with the help of his life-long mentor Gregory McLaughlin (left). . The Pulse Bass drummer Danny Hamilton's excellent play has even drawn the attention and comments from piping judges. Dan plays a Pearl bass with hand crafted sticks made by Mike Cole of Twisted Thistle. Dan also functions as a bass instructor and as the band manager. . In the Middle The drum corps' mid- section includes Bass Man Dan and a dynamic tenor line featuring three different pitched drums played by three top drummers. Tenor Drummer Rob Cirincione (right) heads this effort and is joined in thrilling audiences with alto drummer Marianne Janniello (middle) and baritone drummer Joe Jacobs (left). The tenor line brings a powerful musical component to the band as well as a thrilling visual component. This dynamic trio plays handcrafted Hosbilt drums with sticks made by Tyler Fry. .
Gordon Bell Gordon Bell leads the Monaghan Drum Corps. Gordon has long been respected as one of the Premier drummers in the United States, and has been recognized as a world class drummer by the very best. Gordon was the corps leader for Parlin and District as they dominated the pipe band scene in the United States for over ten years. Gordon grew up as a student of Norman McLeod in the Kenmure Pipe Band. He has lead the corps for Lehigh Valley,and has also played for the City of Washington Pipe Band and the 78th Fraser Highlanders . Gordon Bell was the EUSPBA Champion Supreme for open drumming from 1979 through 1987. He is an EUSPBA panel drumming judge and an instructor for the Balmoral School of Piping and Drumming. Click here for more information on Gordon. Martin Duffy Snare Drummer Martin Duffy first joined the band in 1979. He has served the band as its drum sergeant from 1981-1982, 1991 - 1994, and 1997 through 2000. Martin is a professional fundraiser and is employed by Changing Our World, Inc. and is a very active drumming instructor in the tri-state area. Martin serves as an officer-at-large for the EUSPBA's Executive Committee, and as the vice-chairman of the EUSPBA's Metro Branch. Martin mantains this web site with his wife Valerie. Gregory McLaughlin Greg McLaughlin is a fixture in the pipe band drumming community in the New York area. Greg was a long time member of the Inis Fada Gaelic Pipe Band where he made his mark as a corps leader, a soloist, and a teacher. During his tenure as drum sergeant of Inis Fada, the band won several grade three championships. As a soloist, Greg enjoyed several years as one of the country's top players. At his peak, Greg won seven open contests in a single season. 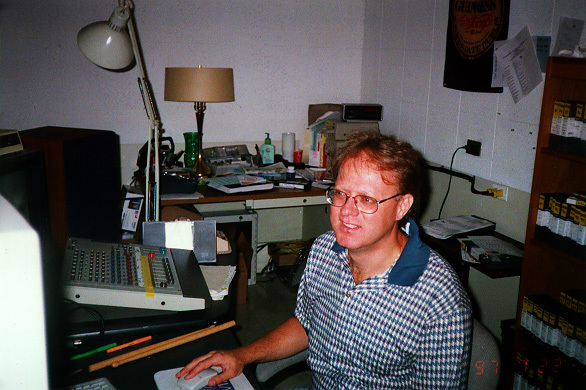 As an instructor, Greg taught many fine drummers in many bands. His relationship with the Monaghan Pipe Band began as an instructor in 1978. Richard Janniello Richie Janniello is now in his second season with Monaghan. HE is a grade two soloist who has been leading the standings in his class all season. More significantly, Richie took a third at the North American Championships in Maxville this summer. Richie formerly headed the drum corps of Greenwich Celtic. He is a Fordham University graduate and currently works as a Server Administrator for JP Morgan. He is married to alto drummer Marianne Janniello. Tom Colgan Tom Colgan started playing in 1980 with the County Tyrone Pipe Band. Over the years his drumming odyssey has taken him to the Glen Rock and Greenwich Pipe Bands. He has served each of these bands as their drum sergeant. Tom is an executive editor with Penguin Books and lives in Bellerose, NY with his wife, Claudia, his daughter, Sarah, and his son, Pat. Denis Gordon Denis Gordon served as Monaghan's drum sergeant during its rebirth year of 1991. He has played snare with the band throughout its climb from grade five to grade three. During this time he has also been the consumate role player, taking any role needed within the drum corps to alow the band to compete. This includes playing lead tip for the grade five and playing rythm tenor and bass for the grade three. Denis originally hails form the County Tyrone Pipe Band and performed on FUV with the Brian Boru Pipe Band. TJ Hagan TJ Hagan was a long time member of the Inis Fada Gaelic Pipe Band. A student of Greg McLaughlin and Brendan Haligan, TJ played snare in a band that won several grade three champion supreme titles and progressed to grade two. TJ is from a family immersed in pipe band tradition. His father, Jim Hagan Senior, was a founding member of Inis Fada where he was the original pipe major. Rob Cirincione Tenor line captain Rob Cirincione began his drumming career in his high school band where he played bass and served as drum captain for three years. Rob competed in the T.O.B. circuit where his school won the Chapter 10 Championship three times. Rob went on to play bass and snare with the prestigious Hawthorne Caballeros Senior Drum and Bugle Corps. 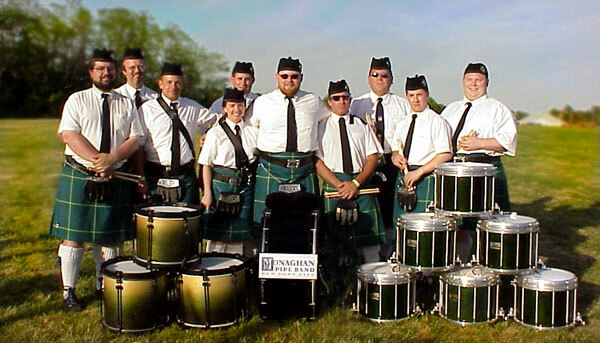 Rob began his transition to pipe bands as a snare drummer with the Bergen County Firefighters Pipe Band. Rob is a landscape designer with his family�s landscape firm in Northern New Jersey. Joe Jacobs Joe Jacobs began drumming with his high school band and furthered his percussion skills as an acomplished kit player. Joe ventured into pipe band drumming as a snare drummer with the Glenrock Pipe Band. After taking some time off from this idiom, Joe returned to the pipe band scene with Greenwhich Celtic where he played snare and bass. Marianne Janniello Marianne Janniello plays the alto drum in Monaghan's tenor line and serves as the grade five tenor instructor and serves as the band's travel secretary. A long time player with the Blackthorn Pipe Band, Marianne is married to snare drummer Richie Janniello. Dan Hamilton Dan came to Monaghan in 1997 after many years as a snare drummer with the County Tyrone Pipe Band where he played along side his father, sister and brother. He competed with Monaghan's grade five unit as a side drummer, then moved to the bass for their grade three outfit. Dan also serves as Monaghan's business manager. When he's not practicing with the band, one of Dan's favorite hobbies is studying and working on classic cars. Dan is an Account Executive at CMP Media, Inc. and currently resides in Huntington Station, NY with his wife Danielle. .
Patrick Timmins Patrick Timmins serves as the band's number two bass drummer. Pat is a plaintiff's lawyer representing many trade union retired and active members who have developed lung cancer & asbestosis due to occupational asbestos exposure. Formerly an Assistant District Attorney in the Bronx where he prosecuted violent felons, Pat began his musical carrer as a disc jockey at Manhattan College's radio station. Our Snare Drums and are bass drum are from Pearl. We have a set of Hosbilt Tenors; an alto, tenor and baritone. Our drum scores are written in Lime Notation Software. Click here to download Lime.